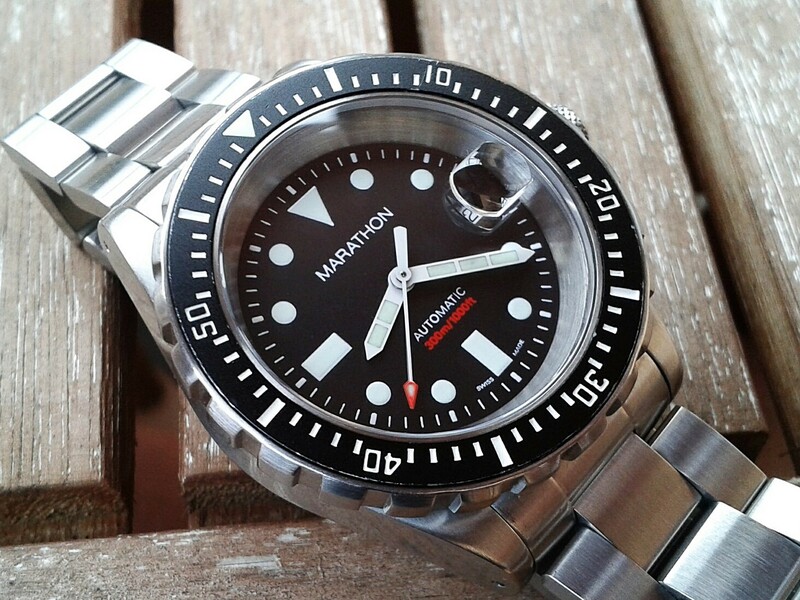 I first came in contact with Marcello C while visiting the old MKII Watches website. The Nettuno was a popular model to modify and MKII had a lot of parts like dials and hands that fitted them. I found my first Nettuno from a watch contact living close by in Stockholm. This was in the beginning of February 2010 and I bought it with the intention to modify it with MKII parts but when I got it I thought it looked pretty good as it was so I skipped the modifying plans. It had the classic submariner look with the black dial and black bezel insert. Regarding the quality there was nothing to complain about. The size was nice, 40mm excl. crown, and the bracelet was comfortable. The movement inside was a standard ETA 2428-2 which kept time perfectly and it was water resistant to 300m. #29 – My first Nettuno 3. The second one I bought was found on the German eBay. It had a silver sunburst dial and silver bezel insert and had more of a Yacht Master look to it. The clean look was very easy to match with all types of clothing and different types of straps. #33 – The Nettuno on an icy balcony. Wristshot at home in my lounge wear. In late May 2010 my wife and I booked a spontaneous trip to Rhodes for the first week in June. I had no suitable vacation watch to bring and needed something fast. I started searching for a used Marcello C Tridente, the big brother to the Nettuno, but all I found was a blue dialed Nettuno which I settled for. It was also located in Germany and with some express delivery it made it up to Sweden just in time for our trip. I used the watch during the whole week and it worked well in all situations. Sold it soon after we came home. Its job was done and its employment was over. #43 – Nice sunburst dial. Looked great in the sun. Found another silver dialed version in the end of October the same year. It was priced so low I couldn’t keep my hands away. I bought it just because I had to but quickly flipped it away for the same price. I was done with Marcello C.
#57 – Wristshot on the balcony of the second silver dialed Nettuno. These watches were fun to play around with in the beginning of my exploring-everything-phase. We are talking about good quality watches priced around $300 for a used one. Regarding the design it doesn’t bring anything new to the table. 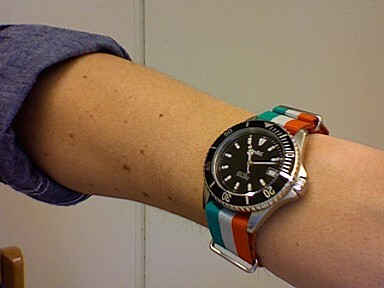 It looks like a Submariner without being a 100% knock off. To me back in 2010 Marcello C felt like a real brand and they gave me an impression of being a serious watch manufacturer. I haven’t checked out any of their news during the last four years so I’m not sure if that still is the case. I remember when I found this one in the end of January 2010. It was for sale as a full set at $800 and located close to my residence back then. Bought it and went to pick it up. The watch was delivered to me on the black original rubber so I went by an authorized dealer for ORIS on my way home to have them change it to the titanium bracelet. They wanted $60 to make the change and at the same time shorten it for me by removing one link piece. I kindly denied their generous offer and slowly backed out of the store. What a rip off! I went to another watch store close by and they helped me out for $10. Thank you! 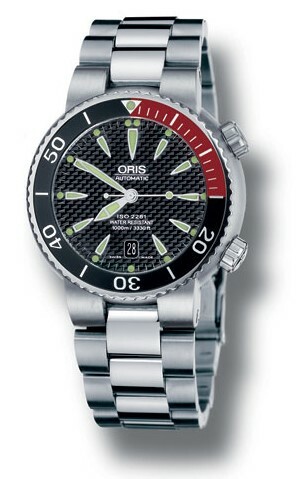 Product image of the ORIS TT1 Diver 1000m. It only took one day to realize that the movement had seen better days. It was losing time. Several minutes per day. I contacted the seller and asked him if he was aware of the problem. It wasn’t something he’d mentioned in his for sale add. He offered me to take it back and to give me a refund which I was grateful he did. I really wasn’t planning to hand it over for a full service the first thing I was going to do. So I went back with the watch and got my money back. The seller insisted on making a deduction for the strap replacement and I told him it was fine as long as he didn’t demand to take it to an authorized ORIS dealership and gave him $10 for the inconvenience. I felt it was worth a total loss of $20 to get rid of trouble. #27 - One of the older versions with the ISO 2281 marking on the dial. The case back shows the ref. 633-7541. A dull wristshot under a kitchen lamp. It was a short friendship but it gave me enough time to evaluate the model. Even though the watch was quite large, 44mm excl. crown, it felt OK to wear due to the titanium but for me it was too big. 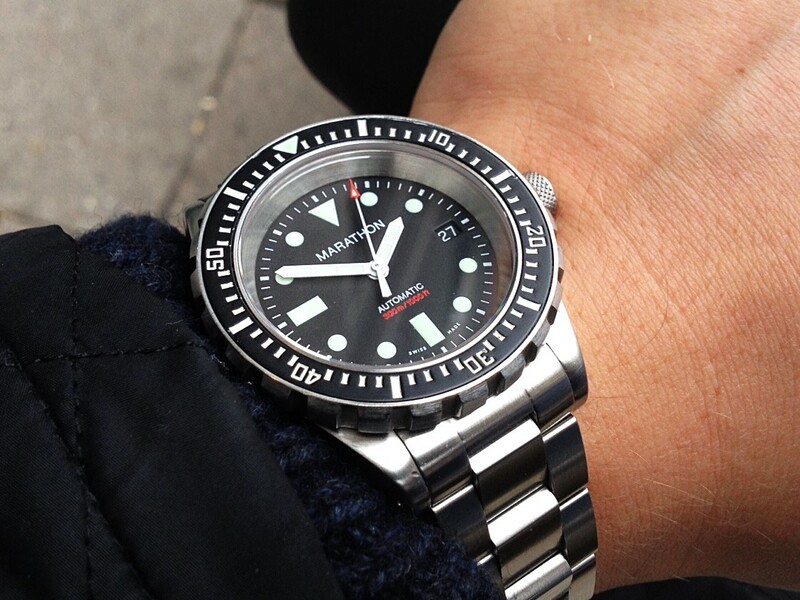 As a pure diver’s watch, fine, but not as an everyday wearer. Last time I told you about my trade when I gave away a SAR for a TSAR. Well well, that might have been a stupid trade but at the time I wanted the TSAR and what did a loss of a couple of bucks matter? The TSAR is the most affordable watch in Marathon’s Search and Rescue line and some might find the TSAR even toolier and more of a multi-purpose watch with its tritium tubes and reliable quartz movement but I find the dial a little too busy which makes it loose legibility compared to the SAR. The TSAR, SAR and GSAR are all based on the same case and measure approx. 41mm wide excl. crown, 14mm thick and 20mm between the lugs. But since they are based on the same case they also share the same problem - the crown. Just a few millimeters shorter would have made the whole watch much more wearable without losing any grip. #24 – The Marathon TSAR. Quartz movement and with tritium tubes. I had mine for six months (quite some time for being me!) and kept it in the drawer and used it only for occasions where a beater was suitable. The TSAR is currently being used by NASA which is pretty cool and I could absolutely go for another one someday. Used ones sometimes pop up for around $300 which they are worth for sure. I recently received another TSAR in a trade. What a great watch. Really! It was a newer one sold in 2014 with the EOL movement and the new tubes glowed so bright. A perfect beater. Let it go though because I needed some extra cash for a watch that was being sent for a full service. #277 - My second TSAR. I got my first Marathon SAR as a part trade when I sold my Sinn U1. I was totally hooked the first time I saw it. At the time in 2010 Marathon didn’t have a webstore and you could only find them used since they had only been issued to the US Army. “A watch built for war must be able to withstand anything!” was how I reasoned and I just had to have one. Apart from that I loved the design. The clean look with a matte dial and ladder hands made it very legible. It looked like a beefy Submariner and not like it had been on steroids. A perfect 300m diver! There was one thing I hated it about it though - the fitting of the bracelet. I’m not saying I’m a genius but I do know how to change a bracelet without any proper watchmaker tools but this was insane. I lost the first one in a stupid trade. I had of course discovered the TSAR – the quartz version with tritium tubes – during my learning-everything-about-Marathon phase. “Wow! Luminous tubes that glows for 25 years and never needs charging? Gotta have it now!” So I put up a want-to-trade add saying I had a SAR and was looking for a TSAR. It didn’t take many minutes before someone answered and offered me a trade. I took it without any hesitation. Stupid! I didn’t know then that the TSAR was much cheaper and much easier to acquire. But I learned from my mistake and moved on. #23 – The first one of my four Marathon SAR's. Issued in 2003. I bought my second one in May 2011. This one was issued in 2006 and had more patina on hands than my first one and also had some battle scars on the bezel. Kept it over the summer and then passed it on to a close watch colleague. #78 – Number two. Issued in 2006. Here on original rubber. Beautiful profile. Look at those lines! Two years later in August 2013 it was time for another one and I got my hands on another piece issued in 2006. I bought it with the intention that the Marathon SAR must be the best tool watch ever made. But I was wrong. The large and deep knurled crown might be designed for easy maneuvering but it is not gentle on your wrist. Dammit! It had to go. #183 – Another one issued in 2006. Taken during lunch at work. Chilling in the sun with beer. Gone fishing! Out on Lake Mälaren in the summer of '13. Later the same year in November a thought entered my mind. “Wait! Perhaps the SAR actually is the best tool watch? 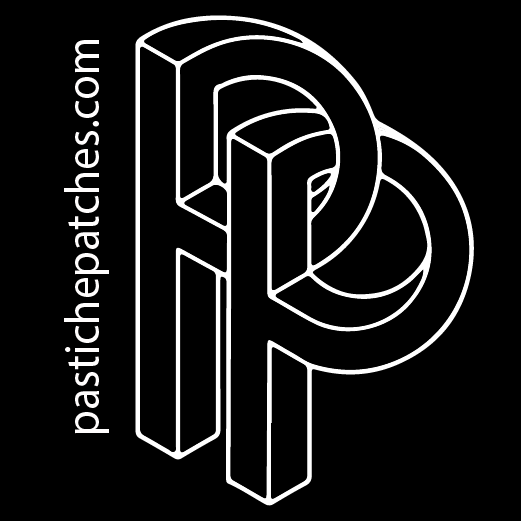 What if you just have to do some changes…” Perhaps there was a solution to the wrist problem? What if you flip the watch 180° so that the crown becomes positioned at 9 o’clock like an Omega ploprof and then just change the date wheel? Wouldn’t that do the trick? Of course it does! So I tracked down a SAR issued in 2004 and took the watch to Magnus and told him we needed to get to work. Mission accomplished. The perfect tool watch was born. #199 – The inverted Marathon SAR. Issued in 2004 and converted to the perfect tool watch. This modification got some attention for sure and when someone asks me if something is for sale, as you know, I’m not hesitating to sell since I always have something else in my sight. So, the inverted SAR was soon gone. The Marathon SAR has become one of my overall favorites of all time. I have developed some sort of love/hate relationship for it. When I have one I think it’s a little too thick and that the large crown is bothering me and when I don’t have one I think it is one of the best looking watches ever made and that I need one because it’s the best beater out there. The bracelet is probably my absolute favorite. Even though it is sort of oyster looking it still has its own design which I love. It is solid but still very flexible and wearable. For now no SAR is in my collection. All I can say is that if you come across a used one for a reasonable price, do not hesitate, just buy it! You won’t be disappointed by the quality. UPDATE - October 31st 2015. OK, so my inverted SAR was put out for sale in July this year by the same person who bought it from me. I was on vacation in France but I contacted the seller right away and said "Hey, let me have it back. I'll pay you half now and half when I get home. Just don't sell it to anyone else." I couldn't stand the thought of someone else having my beautiful inverted SAR. I came home, picked it up, wore it for a couple of weeks and just as before I wasn't 100% sure it was right for me. So I let my friend Björn have it and the moment it leaves me I can feel it's the wrong decision. Luckily I receive it back as a part trade with Björn a couple of weeks later. Yes, I realize all this back and forth business is crazy but I there and then made a promise to make it one of my few keepers. So I had it flipped back and fitted with a black date wheel and now it looks stunning. The idea about the inverted SAR is genious but I just felt I wanted it the regular way and now it feels so right. The return of watch #199. Here on a 20mm bond nato. On a genuine 20mm Isofrane. Back to normal except for the black date wheel. UPDATE - December 20th 2015. This is getting out of hand. I've decided to let the SAR go. It needs to make way for new watches. As I've stated previously: If it's not being used I have to let it go. I hate to see it just lying there in the drawer. I'd love to say that the SAR chapter is hereby closed but I know it isn't. It'll never be over. Never. You know what? In late May 2017 watch no. 199 returned for a second time. I know you're not surprised and yes, I'm insane. Some watches I just have to keep track of because if I lose them they might be impossible to get back. It was of course sold pretty soon after its return and even today I still know where it is located even though it has changed owners a couple of times since it left me. But the next time it gets sold I really hope it disappears forever. Don't get me wrong, it's an awesome watch but we are officially done by now. Mostly wore it on a Seiko MM300 rubber this final round. Worked great, looked great. Clandestine by Entombed. Great album! Back on the bracelet before it was sold.